I mentioned in a previous post that you have to study nature as the first real step in permaculture. Today I want to expand that to mention that observing nature is not something you just do once and then forget – it is perpetual. Take, for example, our latest volunteer plants. Volunteers are famous for tomatoes showing up in compost piles, watermelons near pool fences, and many other fun places. Our volunteers are simply the last planting of lettuce that we had, which we let go to seed. Clearly, some of the seeds fell prior to us collecting them and have regrown. However, what is interesting is how well they have regrown. Just like real estate, plants like location, location, location. Whether it is in relation to the sun, a companion plant, water, etc., plants do best in the correct location. In our case, about an inch of mulch was raked aside to give access to the soil for planting the lettuce. This creates a bit of a gully, with 1 inch high mulch on either side of a long row of lettuce crops. We are watering with soaking hoses, giving a long slow drink to the plants every few days. However, sometimes the water pools in these valleys, which is not what the seedlings want. It stunts and sometimes kills them, if the water is too much to bare. So, what location did the volunteer plants find? Why, the mulch of course. They seeded in the wood chip mulch and are growing larger and faster than the lettuce stuck down in the valley. Now, one could argue that perhaps one solution is simply to water less, so that the water does not pool. However, that would likely cause more problems by having shallow roots on the plants and the soil drying out. So, to learn from nature and put our permaculture hats on, what do we learn? I think we take away that the plants, much like a good army general, want the high ground. The volunteer plants still seem close enough to the planted row that they are benefiting from the soaking hose. So, water, but enough height that the plant itself does not get below the water line. Over the years we expect our soil to be brought up to a quality that it will not need such a heavy mulch covering, which will help. Also, the wood chips that were removed from the planting row were moved to the side of the row that would be “down hill”, which helped cause the dam that stopped the water. These little lessons will come to anybody that gardens. However, we can better respond to the situation if we decide to view the permaculture mindset rather than the commercial one. Instead of thinking that the other lettuces are smaller because they are simply performing poorly, need fertilizer, or another other issue, we can just look a few inches away to the volunteer plant, ask why, observe, then act. 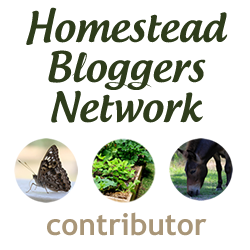 Hi there, visiting you from the Homestead Bloggers Network. I see you like Back to Eden too. Will check out your on YouTube. Why,it’s just like a mini hugelkultur bed! Thinking up some plans to make some “true sized” hugelkultur beds throughout the property.